DELAWARE, Ohio -- The London Red Raiders traveled to Delaware on Tuesday to play the Buckeye Valley Barons. In the end it was sloppy play and turnovers from the Red Raiders that led to a dominant performance from the Barons in a 66-39 win for Buckeye Valley. After a dismal first half London headed to the locker room down 29-15. London began to show signs of life in the to start the second half, as they cut the Barons lead to single digits midway through the third quarter. However, a big quarter from Buckeye Valley freshman and game MVP Troy Scowden helped to shift the momentum back to the Barons. After outscoring London 20-4 in the fourth quarter, Buckeye Valley picked up their first win of the season, improving to 1-1 overall. London has a young squad that is full of potential, however the lack a true point guard that can handle the ball and distribute offensively is what held this team back on Tuesday. The Red Raiders struggled without star forward Jainaz Cameron, who missed his second straight game with a wrist injury. The future of the Buckeye Valley boys basketball program is in good hands. 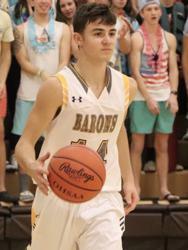 Led by junior guard Dylan Herbert and the freshman Scowden, the Barons will look to compete for a conference championship as soon as this year. Troy Scowden (6’6 PF / Buckeye Valley / 2022): Scowden showed Tuesday why he is considered one of the top freshman in the area, regardless of position. Scowden is a freakish athlete that is as strong as they come. His combination of size and strength make him a matchup nightmare. The freshman is a smart kid that is a very unselfish player that seems to be a great teammate. Despite standing at 6-foot-6, the freshman is surprisingly agile and can handle the ball well on the perimeter. Scowden was a standout in the 270 Hoops Fall League, helping lead his team to an Open Division title. After a quiet first half, Troy turned things around after halftime, finishing with a game-high 17 points. 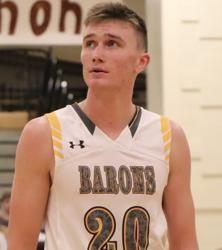 As London began to cut into Buckeye Valley’s lead, Scowden swung the momentum back to the Barons with a strong finish, resulting in a three point play. Scowden is as good as they come in the class of 2022, look for the freshman to have a great season for the Barons. Isaiah Hatem (6’2 WG / London / 2020): The junior Hatem was the lone bright spot for the Red Raiders on Tuesday. Hatem had a fantastic start to the second half, scoring 14 of his 15 points in the third quarter. London will need Hatem to develop into a solid third of fourth scoring option if they want to compete at the top of the Central Buckeye Conference this year.